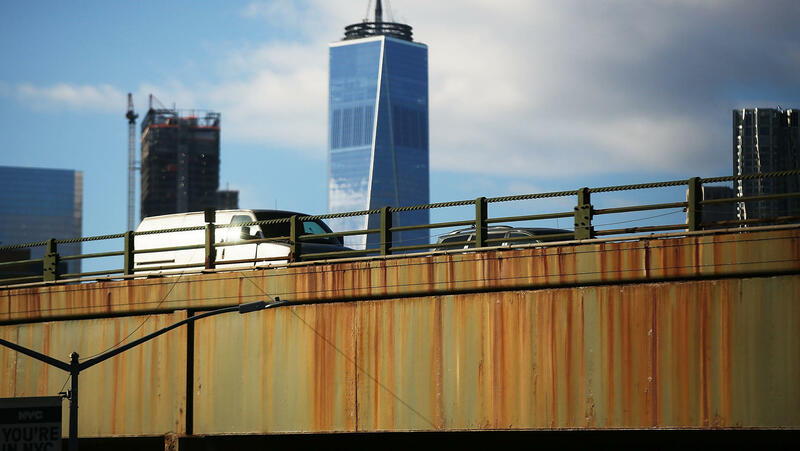 An annual report by the American Road and Transportation Builders Association notes that there are now nearly 56,000 bridges nationwide that are structurally deficient. Both Democrats and Republicans say they're willing to work together on a plan to rebuild the nation's roads, bridges, transit and water systems. "Look, this guy's a builder. He gets it," says Rep. Peter DeFazio, the Oregon Democrat who is likely to be the incoming chairman of the House Transportation and Infrastructure Committee. "It sounds like the president is sincere and wants to deliver." Back in February, Trump outlined what his administration billed as a $1.5 trillion infrastructure plan, but it included only $200 billion in federal funding over 10 years, funded by unspecified cuts elsewhere in the federal budget, and it went nowhere with the Republican Congress. DeFazio has offered a $500 billion plan to repair, rebuild and expand the nation's highways, bridges and transit systems, funded by a 30-year bonding program paid off by increasing motor fuel taxes and indexing the gas tax to inflation. Other House Democrats, including leader Nancy Pelosi, have talked about a $1 trillion infrastructure plan. DeFazio says whatever the number ends up being, he is willing to work with the president on coming up with a variety of different funding sources. But, he says, "my bottom line is it has to be real. We can't pretend. There has to real money, real investment and it needs to be done soon." "This is the buzz saw we tend to run into," says Beth Osborne, who served as a transportation official in the Obama administration and now heads the group Transportation for America. "It will be more challenging than they realize [to reach agreement on an infrastructure plan], because it costs money, and we don't have a lot of money to spend these days," says Osborne. She says she is "hearing some very positive things" on infrastructure from both Democrats and the White House, but she doesn't see a clear vision for what the federal program will be. "They want to build, build, build," Osborne says, "And my question is, 'what do you want to build?' And until I know the answer to that question, I don't know how excited I am about what they're building." The American Society of Civil Engineers gives the nation's infrastructure a D-plus grade and says it would take at least $2 trillion more than is currently budgeted to bring our roads, rails, seaports, airports, levees, dams and water and sewer systems up to par. ASCE's Brian Pallasch says addressing such infrastructure problems has historically been done when government has been been divided, with Republicans and Democrats coming together to pay for it. "The last time we raised the motor fuels tax, way back in 1993, that was done in a bipartisan fashion. When Ronald Reagan raised the gas tax in the '80s, it was done in a bipartisan fashion with a Democratic Congress," he says. In its first two years, the Trump administration has favored rural areas with infrastructure funding and has held back and delayed funding to urban transit projects, even though Congress allocated those funds. But Pallasch says a new, comprehensive infrastructure spending plan could actually help bridge the nation's urban-rural divide. "The reality is there are significant infrastructure needs both in urban areas and in rural areas. And any infrastructure plan that's put together needs to be able to address both," he says. Other Washington insiders agree it may be easier now to come to an infrastructure funding and spending agreement next year than it would have been with one party in full control. "When you have a different party governing one chamber of Congress, it does give [both sides] a little more cover to come up with a deal," says Michael Friedberg, a former top Republican staffer on the House transportation committee, now an infrastructure policy adviser and lobbyist at Holland & Knight. "We have a unique opportunity with a president who has campaigned on this, is willing to buck conservative traditions, and now a Democratic Congress," Friedberg adds. "This change of power might give the necessary kick to both the administration and Congress to make this the No. 1 priority." But the gas tax is, after all, a tax, and Democrats may not want to endanger their new House majority by raising taxes. And some Democrats might not want to give Trump a legislative victory to campaign on. Add to that the president's vow to adopt "a warlike posture" and bring government to a halt if Democrats use their new House majority to further scrutinize and investigate his administration, and any promised cooperation on infrastructure might never get on the road. "It's contentious on both sides of the aisle," says Friedberg. Raising revenue is very hard to do in a presidential election year, he says, "which we already are in now." "But the fact is," Friedberg adds, "we're running out of transportation trust fund dollars and we're going to need funding." The I-word is popping up again. This time, we are not talking about investigations or impeachment. We are talking about infrastructure. It's one of the few issues President Trump and Democrats in Congress might be able to agree on. Both sides say they're willing to work together on a plan to rebuild the nation's roads, bridges and transit and water systems. But, as NPR's David Schaper reports, the proof is in the money. UNIDENTIFIED PERSON: If we could, Sir, we'll have you step down to this side. DAVID SCHAPER, BYLINE: Gold-plated shovels are like magnets for politicians. UNIDENTIFIED PERSON: And three, two, one - turn. SCHAPER: This recent groundbreaking for a big railroad project on Chicago's South Side had them all there - the mayor, the governor, a U.S. senator, members of the House, state lawmakers, even Transportation Secretary Elaine Chao. Now Chao's boss is signaling that there may be a lot more groundbreakings to come, as the president says a big infrastructure package is something he wants to work on with Democrats. PRESIDENT DONALD TRUMP: It really could be a beautiful bipartisan type of situation. SCHAPER: While Trump was combative on a lot of issues at last week's news conference, this wasn't one of them. TRUMP: We have a lot of things in common on infrastructure. PETER DEFAZIO: Look; this guy's a builder. You know, he gets it. SCHAPER: That's Peter DeFazio, the Oregon Democrat and likely incoming chairman of the House Transportation and Infrastructure Committee. DEFAZIO: It sounds like the president is sincere and wants to deliver. SCHAPER: Trump's own $1.5 trillion infrastructure plan, with only 200 billion in federal funding over 10 years, went nowhere this year with a Republican Congress. DEFAZIO: It has to be real. We can't pretend. There has to be real money, real investment. And it needs to be done soon. SCHAPER: And there's the rub. BETH OSBORNE: This is the buzz saw we tend to run into. SCHAPER: Beth Osborne was a transportation official in the Obama administration and now heads the group Transportation for America. She says while Democrats and the White House are saying the right things on infrastructure, there's no real vision. OSBORNE: They want to build, build, build. And my question is, what do you want to build? And until I know the answer to that question, I don't know how excited I am about what they're building. SCHAPER: The American Society of Civil Engineers gives the nation's infrastructure a D-plus and says it would take at least $2 trillion more to bring roads, rails, ports, water and sewer systems up to par. The group's Brian Pallasch says, historically, Republicans and Democrats have come together to pay for it. BRIAN PALLASCH: The last time we raised the motor fuels tax way back in 1993, that was done in a bipartisan fashion. When Ronald Reagan raised the gas tax in the '80s, it was done in a bipartisan fashion with a Democratic Congress. SCHAPER: And Pallasch says a comprehensive plan could actually help bridge the nation's urban-rural divide. PALLASCH: You know, the reality is there are significant infrastructure needs both in urban areas and in rural areas. SCHAPER: Mike Friedberg is a former top Republican House Transportation Committee staffer and now an infrastructure lobbyist. He also thinks that the new Democratic majority could help elevate the infrastructure issue. MIKE FRIEDBERG: This change of power might give the necessary kick to both the administration and Congress to make this the No. 1 priority. SCHAPER: But the gas tax is, after all, a tax. And Democrats may not want to endanger their new House majority by raising it, and some might not want to give Trump a legislative victory to campaign on. Add to that the president's vow to adopt a warlike posture if Democrats investigate his administration and any promised cooperation on infrastructure might never get on the road.